To All Potty Training & Housetraining Problems Of Dogs! Subscribe to the Dog Housetraining Mini Course and Learn New and Advanced Potty Training Tips, Methods and Startegies, FREE!! Just fill in your details below and get started. 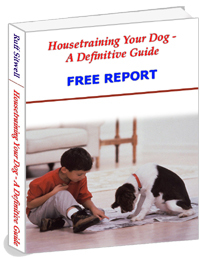 Download the Free Report And Start Potty Training Your Dog, TODAY! Housebreaking Stress & Mess... Permanently!! Our new eBook Package on housebreaking dogs "Housebreaking Your Dog - A Definite Guide" gives a plethora of information on, not just housetraining methods, tips and secrets that will make the experience of potty training your dog pleasurable and hassle-free, but also covers a wide range of problems faced by owners while potty training puppies and adult dogs. Not just that... It is an unique package containing housetraining information on as many as 59 breeds! Grab Your Copy Of This Wonder Book, NOW! With this guide in your pocket, you are surely going to become a proud parent of a fully housebroken puppy or dog. Getting a new dog is like having a new kid at home. It is a whole new bundle of joy, but with it also comes a bundle of responsibilities and the travails associated with upbringing. Potty training is just one of the crucial issues. We have been in the dog training business that long to know that potty training takes time, patience and the exact information. We also know that dog owners who really care for their pets choose to get the very best nurturing tips. That is why we prefer calling them as dog parents. For the benefit of our dear dog parents, we present this whole new site, dedicated to just potty training and the various aspects of it. Why is potty training crucial? A dog that has extensive potty training will not pee or poop inside the house. It will either eliminate outside the house or in the specific place that has been allotted to it. Proper potty training can do the trick, however it is important that you and your puppy find the right method for potty training because some potty training methods do more harm than good - to your dog and to your carpets. Every dog is one of its kind. It has a body and a mind of its own. Just as the temperament of every dog differs, so does the behavior patterns. Most potty training tips are fairly generalized. But we know that every breed needs a customized training process that is unique to it. A specific approach is always a more successful one. To impart a successful potty training, it is important to understand your dog's thinking pattern. Unless you know what it responds to, you will be at your wit's end trying to train it. Your dog would love to keep you happy and stay in harmony with you, but most potty training modules end up confusing the poor creature, because they are not custom-made for it. Many dogs fail to live by their potty training. What could be the reason behind it? Why do some dogs refuse to go out all of a sudden? Why do some of them poop inside when you are not there? Only an expert can say why. Fall back on us for the answers. We will give you easy-to-follow, breed-specific potty training guidance that is sure to work, gently and effectively. The efficacy of potty training depends upon other factors like food, activity and health issues. We will provide you with credible information about all these odds and ends. Potty training is not going to be that bumpy a ride anymore! Navigate through our site to find answers to all your questions. Wishing your pet a smooth and happy potty training! Copyright © 2007 - DogPottyTrain.com. All rights reserved. This site is owned and operated by TrainPetDog Ltd., Cyprus.